Where there’s fresh water there is life! The Benedictine monks knew all about the importance of water when they founded their monastery, and with it the village of Saint-Chinian, near the banks of the Vernazobres river in the 9th century! They harnessed the power of the water to drive mills, and built a canal to irrigate the fields and gardens. The Vernazobres river still flows through Saint-Chinian, and although the water mills are long gone, the canal which irrigates the gardens still exists! When the summer weather has arrived and the cicadas sing their seemingly endless songs in the languid heat, there’s nothing more inviting than a refreshing dip in the water. The river is perfect for that! Upstream, just a little outside the village, is an area called Les Platanettes where the water tumbles over the rocks and flows through a series of pools. The area is shaded by mature plane trees (platane is French for plane tree) and there’s usually a light breeze – heaven on a hot day!! A few years ago, picnic tables were installed at Les Platanettes, and there’s plenty of space if those are already occupied when you get there. 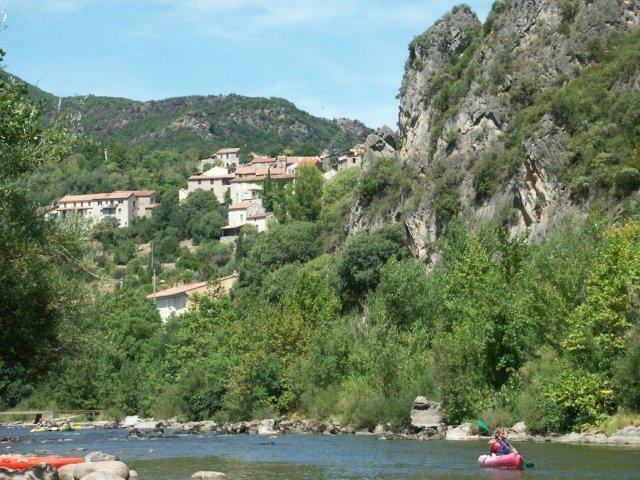 There are more river pools farther upstream from Les Platanettes, just walk along between the river and the vineyards, and you’ll get there! Saint-Chinian also has a semi-olympic swimming pool, for those who prefer to do some serious swimming! The pebble beach on the opposite side of the river is very popular and the plane trees provide welcome shade. To the right of the bridge (in the picture above) is a canoe and kayak base – there’s great canoeing and kayaking all along the river Orb! You can rent a canoe or kayak, and once all the formalities are dealt with and you’ve been kitted out, you’ll be driven farther up the river so you can just paddle your way down to where you started from. 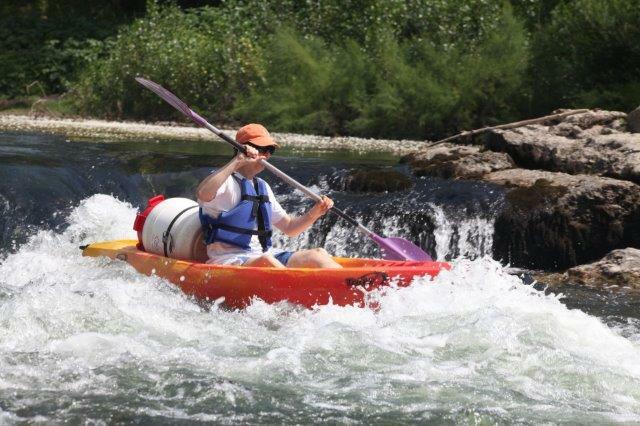 There are several other locations along the river for renting canoes and kayaks. 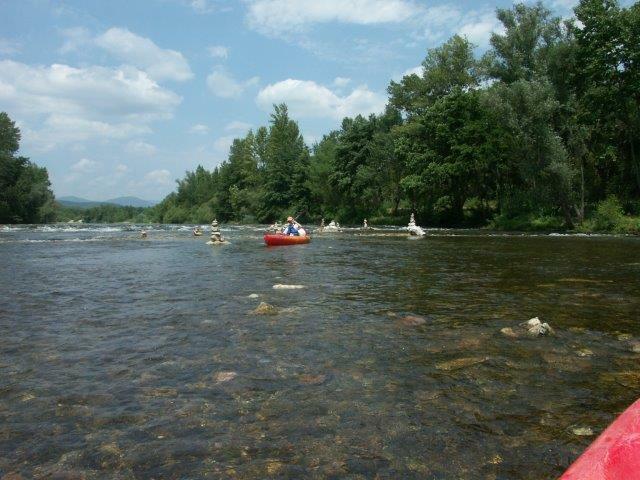 My favourite is in Reals, where the rapids are used for competitions! On the way to the base in Reals there is an exhilarating water slide! 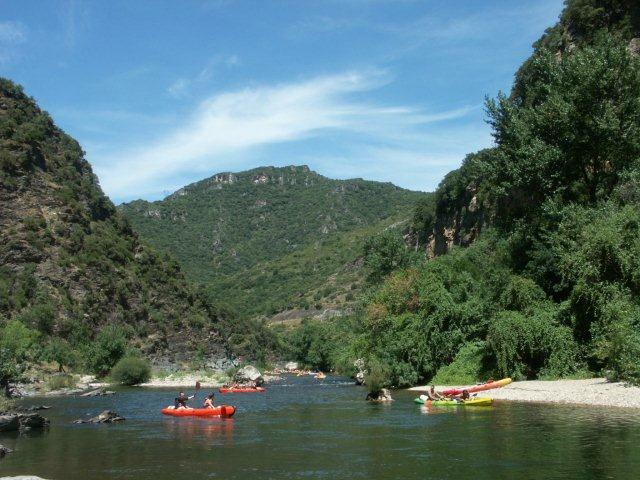 Cessenon, which is located halfway between Saint-Chinian and Roquebrun, is also on the river Orb. The pebble beach there is near the old suspension bridge – very picturesque! The Golfe du Lion is famous for its sandy beaches – the nearest beaches for me are at Valras Plage and Vendres Plage. In the summer it can be quite busy, but there’s plenty of space for everyone! My favourite time of day at the beach is late in the afternoon, when there are fewer people and the heat is less intense! With all this glorious weather it’s time I took a little blogging vacation – but I promise I’ll be back!! And don’t forget: I’ll be here if you need any help with booking accommodation – you can always drop me a line! Enjoy your summer!! Florence from North Carolina (the lady who made the famous Tomato Pie) is staying at Acanthus in St Chinian again this year, and yesterday, on the spur of the moment, we went canoeing together. We had both done the run from Vieussan to Roquebrun before, so decided to explore a different stretch of the river this time. 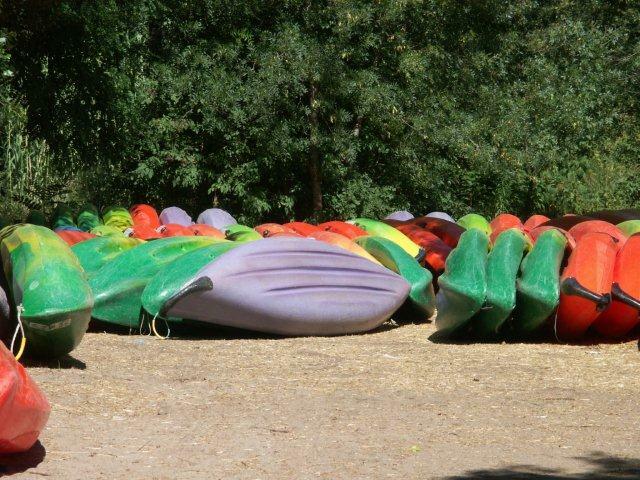 We ended up at Réals Canoe Kayak for our adventure. The departure time for the 5km discovery trip was at 11am, and all was beautifully organised. The receptionist opened the car park barrier for us, and once we had the car tucked away we filled in the paperwork at her desk. As soon as that was done we went down a flight of stairs to get kitted out with life jacket, waterproof drum and paddle. Since we were getting a single-seater kayak each we also got a drum each for the things we wanted to take along: sun screen, water, mobile phone and watch (both inside a zip-loc bag), towel, etc. Here’s a tip if you are going to do this – the larger drums make great back-rests!! Once everyone had arrived and been kitted out we had a briefing session about the route, and then Olivier, the manager, took us on board the minibus and we were off, with a trailer fully loaded with canoes and kayaks coming along with us! 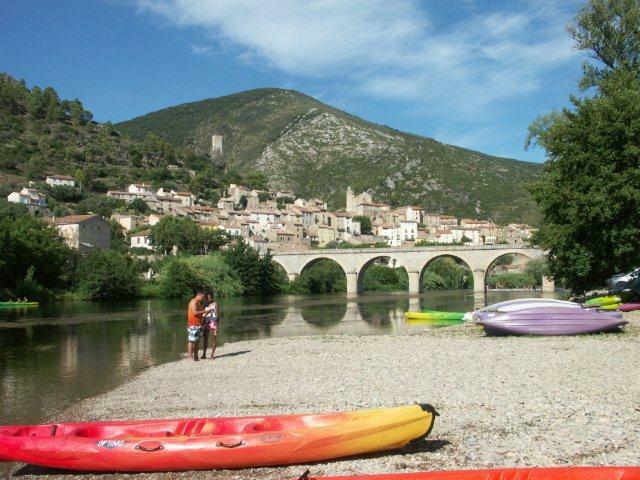 Our starting point was along the road to Roquebrun, just after the newly painted bridge across the Vernazobre river. Olivier expertly reversed the trailer as close to the water as possible, and held another briefing session, explaining how to manoeuvre the boats and how to paddle. And then we were off and right away there was a fantastic rapid – more of a waterfall really, but not too challenging! 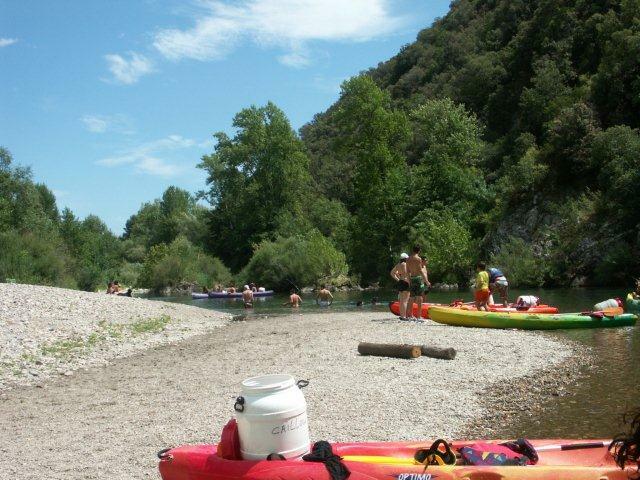 The boats soon spread out, and as ours was only a small group we soon had the river more or less to ourselves. And it’s a beautiful river – until we got to Cessenon there were hardly any people along the banks, and even in Cessenon the beach was not busy. We pulled up for a break there, and a drink and a dip in the river. The water was pleasant and refreshing and definitely not cold! Once past Moulin Neuf we had the joy of a few more rapids. 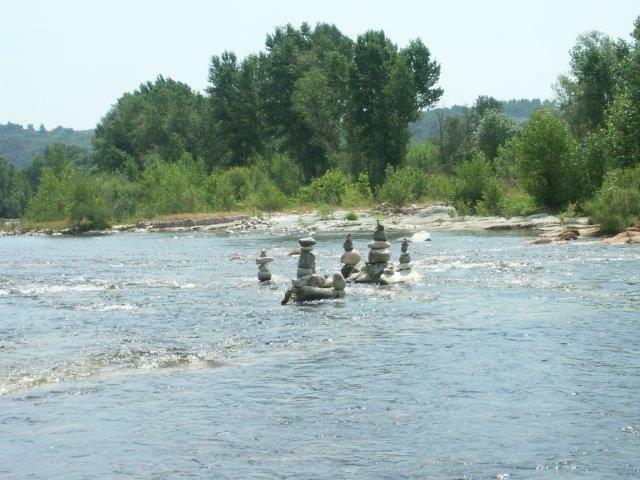 At one of the rapids people had built cairns in the water – beautiful and somewhat otherworldly. We soon got close to Reals where our adventure was to end – we’d been warned to look out for the stop sign, and were on no account to go further. Going past the stop sign would have brought us into the slalom parcours which is used for international competitions. Neither of us felt up to that quite yet, although the rapids did look very exciting and inviting. We pulled our kayaks onto land, and then walked to the base with our paddles and drums. Back at the base there were changing rooms and showers, both of which were very clean. The other unexpected pleasure that day was in the evening – a visit to Causses-et-Veyran for a performance of Boo Cosa Vostra, by the CirkVOST company of artists. Our friendly postie had tipped us off about the show in the morning, telling us how fantastic it was. We headed right for the stadium to have a look at the set-up. 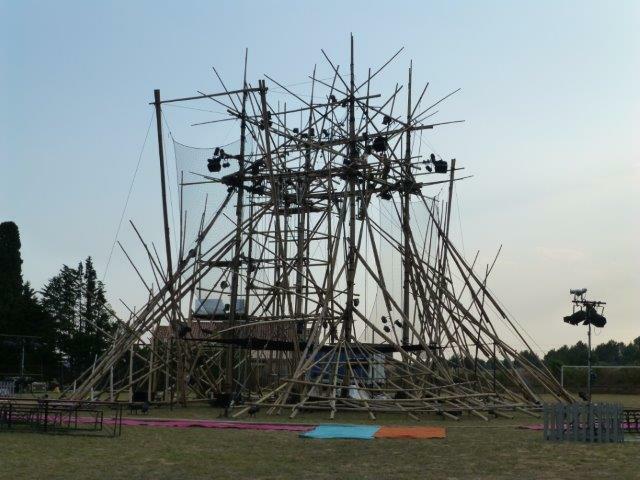 I think you’ll agree that the set looks impressive – a 15 mt high structure, entirely made of bamboo! 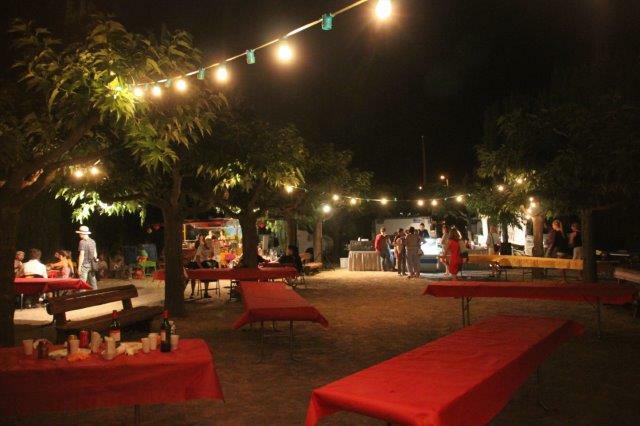 The performance was due to start at 21:45 and we had arrived early enough to grab a bite to eat at the Guingette del Catet, a temporary tavern set up in the bouledrome next to the stadium. Two stalls were doing a brisk trade: La Carriole Gourmande offering quiches, savoury tarts and crepes; Le Traiteur Sagne had a mobile wood-fired pizza oven and grill and was offering a range of food such as regular burgers and duck burgers, several different kinds of pizzas (one with strips of duck breast, creme fraiche and cheese – yummy! ), and a plat du jour of strips of grilled duck breast with a peppery sauce. We placed our order, got our bottle of rosé wine and found seats at one of the long tables. Soon enough our food was ready, and not long after we were joined at our table by a couple from Beziers. We had a wonderful chat, they offered us a taste of their duck pizza, and we shared our desserts with them. You couldn’t imagine anything more congenial! Soon it was getting dark and it was time to bid our new friends farewell and head for the stadium (they were waiting for friends to join them). 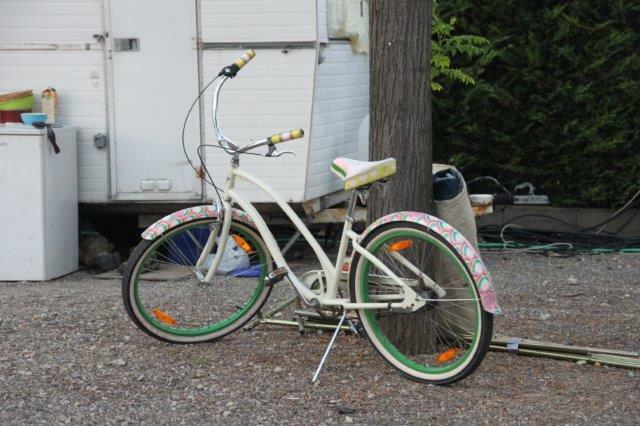 On the way I spotted this lovingly decorated bicycle – and couldn’t resist a picture! Once inside the stadium we grabbed some folding chairs and found ourselves a strategic place from which to watch the show. The sunset was particularly beautiful and made the set look even more dramatic. 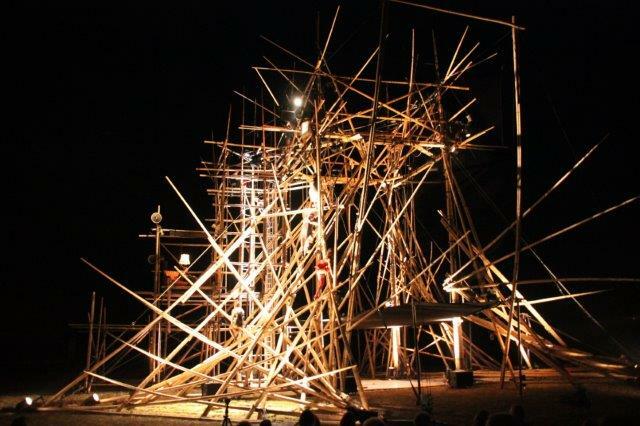 And once everyone was settled the show began: almost unnoticed the acrobats had climbed up into the structure, and when the lights came on there they all were, perched perilously high up! One by one they fell into the net below, and then climbed up again in a choreographed kind of way, and then the real acrobatics started. A duo of ladies in long dresses on a trapeze, which oscillated around the central area, all the movements incredibly slow, and beautiful to watch. More daring hand-to-hand acrobatics up high, and then the ladies came on again, this time on two separate trapezes. The grand finale came with some incredible flying trapeze stuff, people flying through the air and being caught, all done with incredible precision that must come from endless hours of practice! I managed to take a few short videos to give you an idea of the amazing spectacle (e-mail subscribers, please visit the page to watch the videos). With friends and family visiting, and the weather being fabulous, we decided to try our hands at canoeing. My friends from Japan had canoed down the Orb river several times before, but in all the time I’ve been here I’d never managed to go. Now was the time to do it, and so one sunny morning we set off for a drive to Roquebrun where the adventure starts. We’d settled for the 10km run, as I felt that for my nephews and myself a 15km ride would be too much for a first experience. Departures for that particular run are at 11am and 2pm and we had to be at the base half an hour before the start. The number of people was impressive, but so was the efficiency with which everything was dealt with. First queue up to pay and fill in the contract. Then join the queue for the equipment. 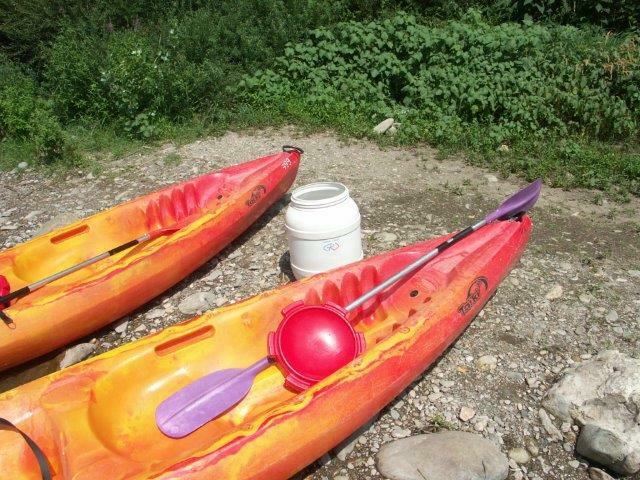 A drum for each boat which allows you to take things with you and keep them dry. Then helmets for the smaller children, life-vests for everyone and finally the paddles. Now that we have everything we go to where the bus departs to take us to Vieussan, where we’ll get on the river. After a 15 minute ride, we arrive at Vieussan and get a briefing explaining the basic manoeuvres and rules. And off everyone rushes to get a boat – there are plenty and so we decide to let the crowds go first, and take it easy. My friends’ experience came in handy on this trip: the drums come in three sizes and make great back rests, the larger the better. And of course the boat needs to have a space at the back and straps so that the drum can be secured there. All the drums have names written on them, and you have to remember what yours is called, in case it gets washed over board. 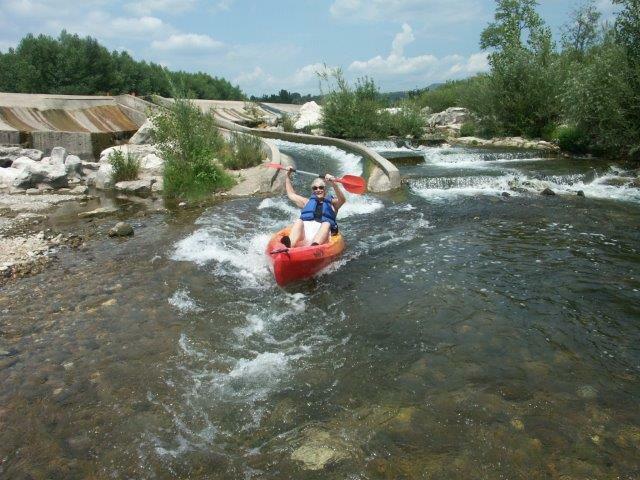 You can then pick it up again at the next rapids or in Roquebrun. My drum was named caillou – French for stone 🙂 . I’d bought straps for my glasses and sunglasses and tied them securely to the glasses, as well as behind my head to make sure they could not come off. A good move as it turned out! Our instructor told us that we had to get under the low bridge in Vieussan before noon, as the hydro-electric station further up the valley would be releasing some water, meaning that we would have to carry the boats rather than slide under it if we were too late. So we set off and I was amazed at how easy it felt. Under the low bridge, lying down and hoping for the best, under the large bridge in Vieussan, which seemed enormous from down below, and across some small rapids – OK so far. 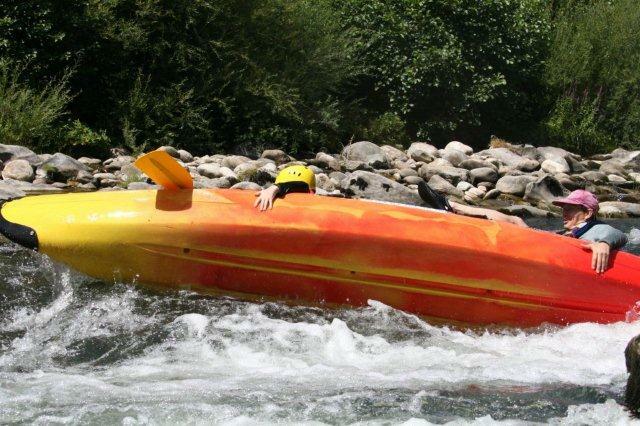 Then came the Rapide de la Tortue and that’s where things got a little hairy – I managed to flip the boat over!! Nothing drastic though, a little scrape on the shin, a stubbed toe and bit of water in one ear. Amazingly I managed to hold on to my paddle and my friends were of course waiting below the rapids and caught the boat. And my glasses stayed on!! My nephew also dealt with it really well and came out better than me without any bruises. After all that excitement we stopped and had a little rest, a drink and a snack, and then carried on. 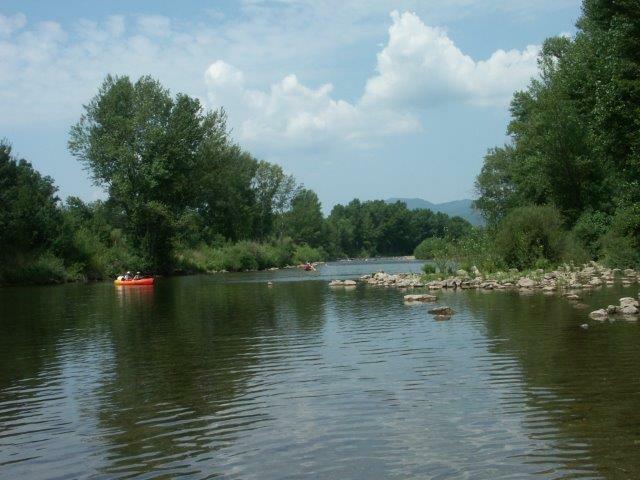 The scenery from the river is beautiful, and I saw many things which are not visible and accessible from the road. Along the way we saw an otter jumping over the rocks, and further on a horse was by the waters edge. I did have my old camera with me, but since it’s not waterproof it only came out when we were taking a break. We did stop a few more times; there’s no time limit as to when the boat has to be back, so a dip here, a rest there make no difference. Oh, and I almost forgot to mention the water fights we had between the boats – what a laugh!! The last stretch of water is wide, slow and beautiful and the children just got out and swam almost all the way back to the base while the adults just drifted. The water was warm and everyone had a wonderful time. Back at the base we handed in all our gear and before going home we all had a drink and an ice cream at the snack bar – total bliss! One of the most important things on the trip was sun-screen. My nephews are very fair and burn very easily, but with regular applications neither had any burns. So all in all a fantastic day out, and one that I’ll be repeating again before too long!